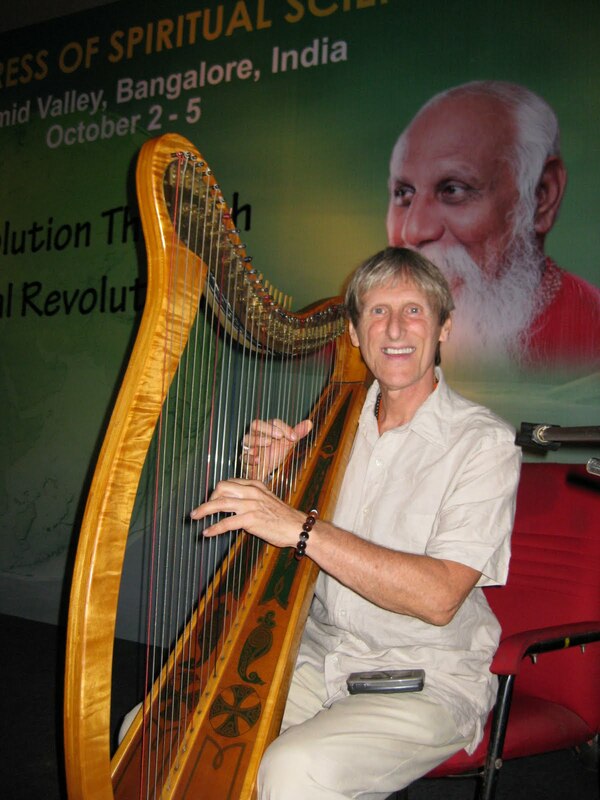 Erik Berglund performs in Bengaluru. The crystalline sound of Erik Berglund’s Irish harp is sublimely celestial – soulful and angelic. The world renowned recording artist who has performed in almost all the major cities in the world and “major power points” such as Machu Piccu, the Great Pyramid, Glastonbury, Easter Island, Mt. Fuji, the Grand Tetons, Lake Louise, the Yucatan, the Hawaiian Islands and the Holy Land, is also a sensitive healer who has touched many lives. With his unique 33-string harp, specially designed “to vibrate the heart” by his teacher, the legendary harpist Mildred Dilling in New York City, Erik enchanted the delegates of the Global Congress of Spiritual Scientists, delving into the core theme, ‘Earth Evolution Through Spiritual Revolution,’ recently in Bengaluru. Since he has also studied meditation, healing and life lessons with the great spiritual teacher Hilda Charlton, Erik’s musical sessions are interspersed with deep meditative retreats and insightful anecdotes. He recalled how, cycling through a New York City street, one day he came across the Danish fairy tales writer Hans Christian Andersen’s statue. One of his friends had remarked that Erik had a close resemblance to Andersen. Later, while touring Denmark, Erik visited Andersen’s home and to his dismay found some childhood photos of Andersen that looked almost like photocopies of his own album! Erik believes that though the world will not come to an end in 2012, there is going to be a tremendous shift in energy, a possibility of great transformation. “The ancients had foreseen this. The Mayans called it the Day of Creation. The Incas said the outer space will touch us. All the pyramids, their consciousness and energy, will be activated. Here’s our greatest potential for coming into light in 26,000 years,” says Erik. But for now Erik Berglund would be content to pluck the strings of his heavenly harp – soothing your weary soul.